It’s July, so the Disney Parks – East Coast and West Coast – are going to be hot. In some cases, the heat will seem close to unbearable; however, there are a few things you can do to stay cool and enjoy your day. 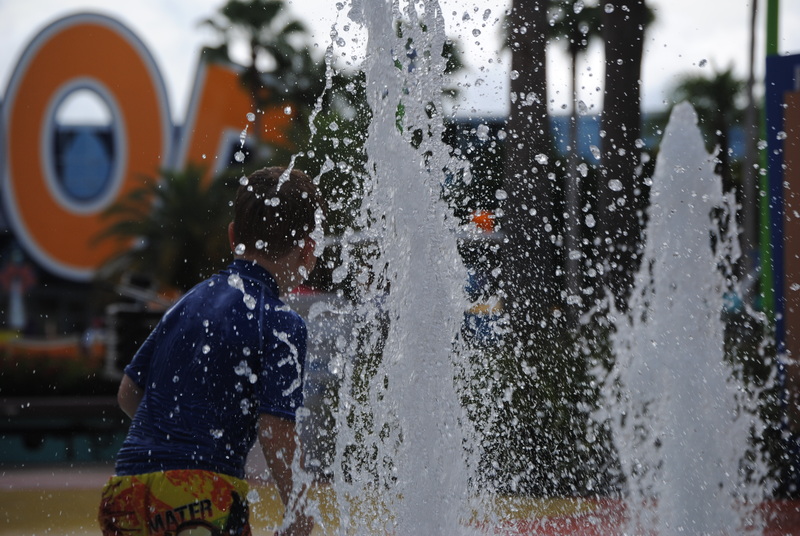 One key to staying cool is staying hydrated and the best way to do that is to drink lots of water when you are touring the parks. Many people today are averse to drinking water from the drinking fountains (especially in Florida, where the tap water tastes a little like…Florida? ); however, it is free and plentiful. The casual service restaurants and snack carts will also provide you with a FREE cup of ice water if you ask. Some people prefer bottled water; it is available for about $2.50 per bottle, but you can also get a case or two sent to your resort prior to your stay. Many online retailers will ship it there for free, and it can save you a bundle in the parks. If you’ve ever vacationed in Disney World during the summer, then you know that misting fans are as ubiquitous as Mickey’s face. For about 20 bucks in the parks, you can pick up one of these water bottles with attached fan. They are usually sold in large bins filled with ice, accompanied by a pusher..er, vendor who gives you your first mist for free. These are also readily available at your local Walmart or Target for a fraction of the cost. Another, more recent phenomenon is the use of special cooling pads while walking around the park. These pads, or towels, are made of a special material that gets very cool when wet. You won’t find them in the parks, but you can pick them up before you leave at sporting goods stores or online. Spending afternoons at the resort pool is a great way to keep cool during the summer. So, this one isn’t usually listed among the other tips to keep cool, but it makes a lot of sense: it’s cooler in the air conditioning than it is outside, so you want to spend as much time in there as possible. The best way to spend more time in the attractions is to know which ones you are going to visit and to spend as little time as possible wandering planless and standing in outdoor queues. Stopping and smelling the roses is a totally worthwhile diversion in the Disney Parks, but if you are there in the summer, I would reserve this activity for later in the evening when things begin to cool a little. Hit up touringplans.com (personalized, but with a subscription fee) or easywdw.com (general, but free) before your trip and make a plan that suits your family. Then spend more time riding and less time baking! Don’t forget: getting overheated is not only uncomfortable, but also dangerous. If you begin feeling lightheaded or dizzy, drink some water and see a cast member right away. Stay cool and have a great vacation! Great yet simple tips that really make a difference! Nice job! -Mary P.